Check-in time is 3pm on the day of your reservation. Keys must be picked up at the RPM office in Playa Langosta which is just about 3 minutes from our house. You must pass by the house in order to reach the office. Do not pick up keys at the Casablanca complex. For security reasons, keys are not given to the on-site security guards do to the personnel rotation and turnover of these jobs. If you are arriving during non-business hours, please tell owner, Brenda Marafioto, in advance to make special arrangements for key pick up and check in with RPM. If did not arrange for a late arrival but are running to be late due to late flights or longer travel by car, call the RPM office directly during business hours on the day of your travel to let them know. Phone numbers are provided above for both outside Costa Rica and inside Costa Rica. If you arrive after 5, a guard in the Villas Langosta complex (in front of RPM Langosta Office) will have your keys. Also see our listings on VRBO and Homeaway for comments from our past guests. 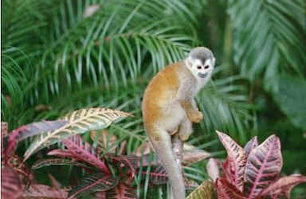 There are four types of monkeys found in Costa Rica: Howlers, Spider, White Faced and Squirrel Monkeys. Howlers are the most common type you will see in Tamarindo--sometimes just outside the bedroom window or in the trees on the stroll to town. 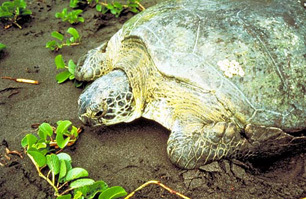 The Leatherback sea turtle is common in Costa Rica. Playa Grande, just across the bay from Tamarindo, is a turtle conservation area and one of last safe nesting area for the endangered species. 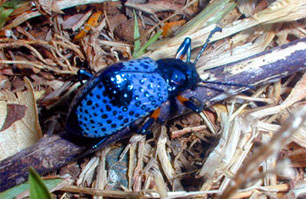 Interesting but beautifully colored insects including butterflies, grasshoppers and beetles are found in the tropics.